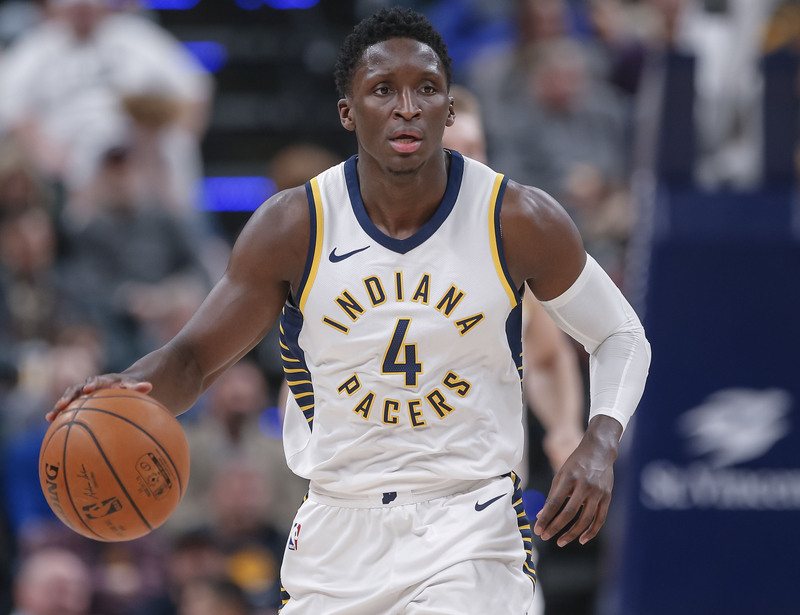 After being traded for Paul George during the offseason, Victor Oladipo's breakout year has been the difference between a losing season and the No. 5 seed in the Eastern Conference for the Indiana Pacers. The Indiana Pacers were never supposed to be here. This was a team that reluctantly traded away its best player, accepting in return two members of Russell Westbrook's pilloried supporting cast. It was a group that found some early success, arching eyebrows around the league. Their success was the kind not meant to last—cute for what it was, but somehow seen as less real than the wins of their Eastern Conference peers. Something didn't add up. That something was Victor Oladipo, this year's open-and-shut pick for the Most Improved Player award. His star turn is the difference between the losing season expected of Indiana and the possibility to finish with one of the three best records in the conference. The Pacers have just one fewer win than the Thunder, but none of the fanfare; they could quietly wind up as a home-court team with an All-NBA player, the kind of turnaround that typically takes years. The Orlando Magic have never recovered from trading Dwight Howard in 2012. Yet as of Sunday night, the Pacers have officially won more games in their first season without George than in their last season with him. Their story is striking because of their overachievement. Take stock of this roster and you'll largely find solid players deployed intelligently. Oladipo's shot creation prevents Darren Collison from straining his skill set. Bojan Bogdanovic guards the opponent's top wing threat because that's the arrangement the Pacers can best support in help. Myles Turner, Thaddeus Young, and Domantas Sabonis bring a mobility to Indiana's half-court offense that greases its wheels. That this team could be above average on both ends of the floor is an incredible accomplishment for all involved. It also speaks to why the postseason will test the Pacers in entirely different ways. The problem for teams that are greater than the sum of their parts—like Indiana—is that the playoffs have a way of being reductive. A carefully tailored defense can all but force the ball to the most limited players on the floor. A smart, well-prepared offense will attack the same sore spots relentlessly. Any seven-game series will push a team's system and chemistry, but it owes its machinations to the talent involved. Tactics call, and the winning team respond. One could paint this possession as a trial for a newly risen star; every high-usage ball-handler must learn to deal with defensive pressure, and Oladipo is no different. But let's interrogate the possibilities here. Should Oladipo really lob a pass to Turner, who at best would likely reset the possession? Is there any value to getting the ball to Cory Joseph on the wing, considering how high on the floor he would need to be to even receive that pass in the first place? And wouldn't a pass to either of the corner shooters be as good as a turnover? This is a problem Indiana runs into often, and one they'll only see more of in the playoffs. The Pacers run more pick-and-roll-derived offense than all but three other teams, per Synergy Sports. The rest of the league knows this—and, more specifically, knows how little dynamism Oladipo has to work with. That he often decides to drive straight at the double team or split the defenders is less a snapshot of Oladipo's decision-making than of his circumstances. Those limitations give the Pacers' problem-solving efforts a certain clumsiness. On many nights, their most reliable solution is to simply lean more on Oladipo, the most capable shot creator on the roster by far. Anything else can get Indiana too far out of its base offense to do anything comfortably, which is exactly the defense's intention. Trapping the pick-and-roll is a fairly basic strategy, but the Pacers have little way around it. Their offense needs the ball in Oladipo's hands in order to function, and yet asking him to grind out possessions against that kind of pressure both warps the risk-reward balance of his playmaking and wears him down over the course of a game and a series. Because of their limited options, whatever playoff counters the Pacers come up with will surely contribute to Oladipo's diminishing returns. Already we've seen signs of wear from the way Indiana's lead guard has scaled up his offense. Oladipo is already at his least efficient in fourth quarters. Since the All-Star Break, his true shooting has buckled from 58.9% to 49.5%. These are understandable fades for a player using more possessions than ever before, but what happens when the Pacers need him to play even more minutes in the playoffs? How might he hold up when opponents are keyed in against him for every possession? Allowing Oladipo a less threatening individual matchup gives him latitude to chase steals and disrupt the flow of the offense. Put even a touch too much air under a pass and Oladipo will bat it away. Fail to put enough zip on one and he'll jump it easily. This basic strategy—along with putting the 6-8 Bogdanovic on the ball—allows the Pacers to force tons of turnovers without fouling, creating the foundation of a competent offense. Cut to the playoffs, however, and some of the subtler variables involved shift in meaningful ways. Opposing stars will be playing more minutes, which tilts the balance of Bogdanovic's defense into more dangerous territory. Shorter, customized rotations leave fewer cheatable matchups, making it more difficult for Oladipo to roam free. The Pacers have been awful defensively this season without the safety net of Oladipo's roving help. Scaling back his range to hunt steals and deflections could highlight some of those same limitations. Oladipo, fundamentally, might be too important. It's through his electricity that the Pacers maintain their offense, and through his activity that their defense survives. Most every other Pacer is stretched to their natural limit—parked at the brink where to do more would likely mean to do worse. Other teams will max out their best players and their best lineups. The strategies they employ will demand answers. And it's there that the Pacers will tie themselves in knots, bound by the constraints of arriving ahead of schedule.